I called my card designs Photoart because I love taking photos and creating art from the images I capture. Whether its nature, pet portraits, flowers or abstract shapes, I love recreating those images into a new piece of artwork. I try to make my designs as imaginative and unique as possible. They are distinctive, contemporary and often quirky. The designs are available to purchase as quality greetings cards, gifts sets of mugs and cards, little hearts of happiness, posters and, coming soon, ceramics. You can see what I’m currently working on via my Photoart Facebook page. Do come and visit! FREE delivery on all card orders worldwide. Postage & packing cost for gift sets is £5.95 for worldwide delivery. See what other customers have to say about my work and products. Bespoke cards are also available from my range. A design can be tailor-made to your own requirements, for example logos and branding can be built into into the artwork (bulk orders only). Or personal messages can be printed (minimum order ten cards), for example you or your organisation may wish to say something personal in Christmas or ordination cards. Contact Sarah to discuss your requirements. The Photoart range includes posters and enlarged prints. Most of the card images can be made available as posters, which are designed and printed on request. 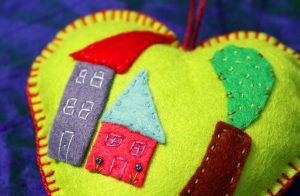 I’ve also designed a new handmade range of delightful gifts – Little Hearts of Happiness. Contact her for more info or to order one handmade for you. 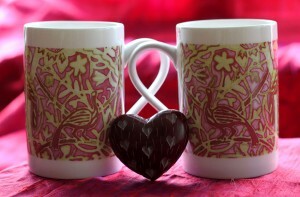 Photoart fine bone china mugs showing ‘Tree of Life’, a design inspired by William Morris. Sarah’s collection also extends to gift items. Selected designs are chosen to be made into earthenware or fine bone china mugs and are sold in pairs with a matching card. These make great gifts! Sarah showcases The Story of Noo. 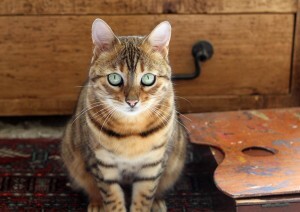 These images capture the life and adventures of an extraordinary cat. Find out more on Noo’s Facebook page. Websites of artists, creative people and organisations that Sarah admires or supports can be found here.